In essence, Steven E. Kaufman’s work shows how self-relational Consciousness produces and interacts with reality. But to appreciate the important work done by Kaufman, one needs to read the whole 325 pages of this Focus Issue of JCER covering his work. Our goals with this Focus Issue are: (1) bring broader awareness of Kaufman’s work by scholars and all genuine truth seekers; and (2) promote scholarly discussions of the same through commentaries and responses to commentaries in the future issues of JCER. In so doing, we hope that all of us may benefit in our endeavor to reach higher Consciousness within ourselves and build a genuine Science of Consciousness. This article is a continuation of Kaufman’s work previously published in SGJ Vol. 2, No. 3 (2011), in which work the relational-matrix model was developed and described as a dynamic structure composed of existence involved in a defined set of relations with itself. The purpose of this article is to relate the relational-matrix model, as a dynamic structure, to what we apprehend as space-time by demonstrating that certain fundamental behaviors and aspects of physical reality can be explained in the context of the defined set of relations of existence to itself that were previously described as composing the fundamental structure of reality conceptualized as the relational-matrix. 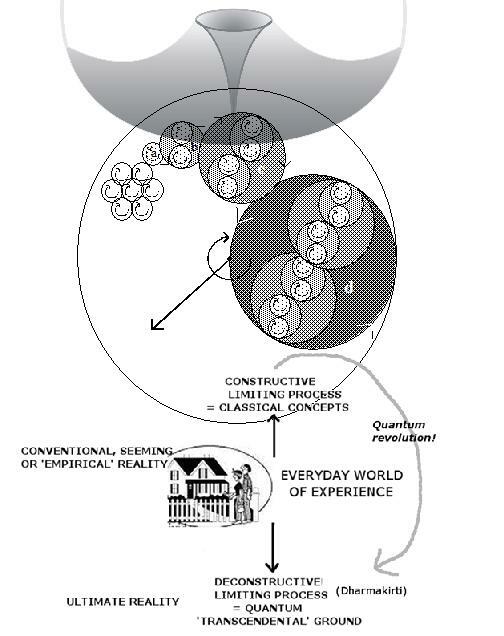 Specifically, within the context of the relational-matrix model, we will account for the following aspects of physical reality: (1) the relationship between space and time, including the basis of temporal relativity, as well as the precise nature of time as a function of the dynamic aspect of the spatial structure; (2) the basis of the speed-of-light constant, including why the frequency and wavelength of electromagnetic radiation are inversely related as a function of that constant; (3) the basis of Planck’s constant, including why the energy associated with electromagnetic radiation exists in discrete amounts, or quanta; (4) the nature of gravitation, including why matter and gravitation are always associated and why gravitation is universally attractive; (5) the equivalence of the gravitational and inertial forces; (6) the relationship between electromagnetic radiation and gravitation; and (7) the nature of energy. Using the relational-matrix model to explain these aspects of the behavior of physical reality will establish a conceptual basis for understanding how physical reality extends from the structure of space. By the end of this article, we will also have established a conceptual basis for understanding why nothing can truly be separated from anything else—i.e., why nothing can be said to exist independent of all other things.. The Buddhist metaphysical conceptual analysis of the nature of reality has always been founded upon the basis of a rigorous employment of scrupulously coherent conceptual analysis, which is in turn based upon an empirical observation of experience in a manner appropriate to the time, although one major difference between the empirical attitude of Western science and philosophy during the age of science and that of Buddhism was the Buddhist development of rigorous techniques of meditation in order to explore the structure and nature of consciousness. In this paper I will use the Buddhist philosopher Dharmakirti‘s imaginative deconstruction of reality, in the context of quantum theory, to try to answer the question which seems to be posed by quantum theory: Is 'Reality' really real? In our search for the ultimate nature of reality we have to leave behind the 'seeming' appearances of the everyday world, however persuasive the appearance may be, and break through to a more 'ultimate truth' concerning the nature of reality. We shall discover that Dharmakirti's philosophical analysis, alongside other Buddhist insights, which lead to the 'ultimate' realm of 'empty' Mindnature, prefigures modern quantum discoveries.